Russia has launched mass production of the Ka-52 strike helicopter nicknamed ‘the Alligator’. Based on the Ka-50 ‘Black Shark”, the new version is designed as a commander’s vehicle and has several features for combat coordination. Ka-52s will be manufactured at the Progress factory in the city of Arsenyevsk in Russia’s Far East. The producer hopes up to 30 Alligators will be completed by 2012 and says the aircraft has great export potential. The series was launched 10 years behind the initial schedule. The Ka-52 made its maiden flight back in 1997, but lack of finance stopped it from production. The Ka-52 is a multi-purpose all-weather combat helicopter intended to be a commander’s vehicle. It is equipped with an enhanced targeting system that can detect targets by optical, RF (radio frequency) and thermal sensors, track them and distribute between helicopters in the unit. Operating the system calls for adding a second pilot’s seat to the cockpit. Unlike traditional designs, the seats are side-by-side, which somewhat hampers the Ka-52’s aerodynamics, but allows better coordination between the two and makes the helicopter’s system more reliable. Both seats have controls so as a side benefit the Ka-52 can be used for pilot training. The Alligator has kept most of the weapon systems of its predecessor. It has a built-in 2A42 30-mm automatic cannon and can be fitted with Vikhr supersonic anti-tank laser-guided missiles with two-stage warheads, Igla guided air-to-air missiles or S-8 rockets at its four hard points. It can also be used to deliver bombs. The wide array of weapons and modernised electronic warfare system make the Ka-52 a powerful and versatile strike helicopter. 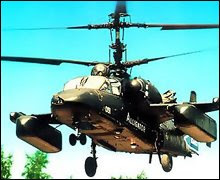 The Ka-52 was developed by the Moscow-based Kamov design bureau. Its long-time specialty is its coaxial-rotor helicopters (with one rotor avove the other), which don’t need a tail rotor. The bureau is part of the OPK Oboronprom holding that brings together the majority of Russian helicopter producers.